The board members are key players and hold senior C-suite or executive positions, representing a diversity of sectors – from FMCG to financial services. Each nominee was identified personally for their alignment to the MMA’s global board and for their active involvement in, and contribution to the local marketing industry. 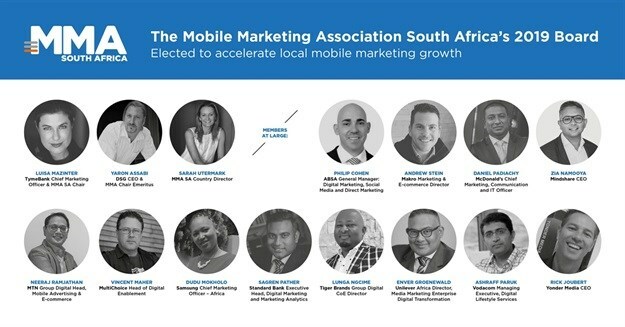 As board members, their top-level experience and participation in the industry will play a major part in driving the MMA SA’s strategic direction, when during their one-year tenure they will aim to direct the organisation’s focus towards productive targets and take on a diverse spread of local initiatives. Sarah Utermark, MMA SA country director says, “Our elected board members are our eyes and ears on the ground. Working in the industry, they bring to our attention the biggest issues that impact upon their day to day business such as, brand safety, measurement, organisational structures, attribution and business impact. This highlights the ongoing trends and innovations that affect mobile marketing’s efficacy. The board will also ensure that relevant MMA global programmes and research studies are leveraged at a local level to benefit and aid mobile marketers to make better business decisions. Current projects that the new board will work closely with the MMA SA on are attribution, brand safety, brand and performance, creativity and business impact, fraud, marketer organisation structure and maximising ROI, among others. In addition to the 14 board members, McDonald's, MTN, Standard Bank and Vodacom will form part of an executive committee as MMA SA’s strategic partners for 2019. Alongside the country director Sarah Utermark and the MMA chair and vice-chair, they will create a framework that will ensure a successful launch from SA into sub-Saharan Africa over the next few years. They will also be involved in all aspects of white paper releases, Smarties growth, thought leadership as well as the strategic planning and execution of local initiatives. To learn more about the board, strategic partners and the MMA SA’s 2019 projects and programmes, click here.